As an author, you’ll find it essential to establish your brand and provide an accessible hub for your online presence. When your content is spread out over various sites, it becomes even more important to develop a way to associate them with your identity and provide a means for readers to locate more of your work. Having a website, a blog, and a social media presence can be very useful, but you absolutely need search results to make newcomers aware of these things. Rel=”author” has acquired increased importance with HTML5, thanks in no small part to Google’s authorship program. Simply put, the attribute makes search engines more likely to provide results weighted to the author of content, and Google makes it easier for the author to establish a central location for interested readers on Google+, of course. But the authorship program also generates a few extra goodies right on the SERP itself — a “more by” link and a brief bio (including a photo, which we’ll soon discover is essential to make this all work). 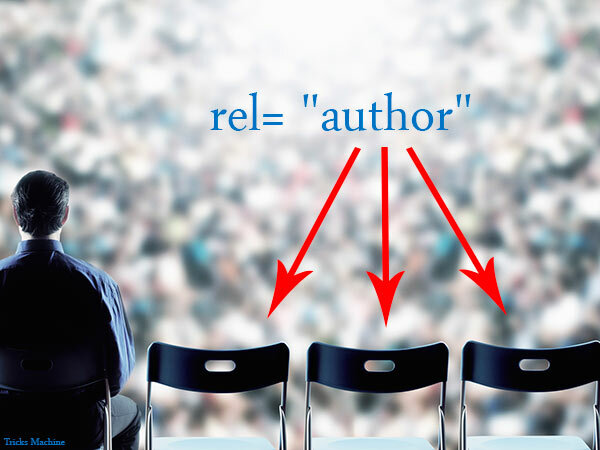 Any markup can include the rel=”author” attribute, but WordPress makes it easy to implement in a number of ways. And don’t freak out if it doesn’t produce results right away; you’re still at the mercy of Google’s crawling schedule, so be patient and give it a week or two before you start wondering if something went wrong. If it’s your own website, and all of the posts are yours and yours alone, you don’t need to go to the trouble of adding a byline to each and every post. Simply go to your WordPress Appearance → Menus and click on “Screen Options” up at the top right. In the box that pops out, you’ll want to check the “Link Relationship (XFN)” box. This will enable that field to show in any menu item; if you have an “About Me” menu, it will be below the URL to your “About Page.” If not, simply create a new menu pointing to the page. Either way, simply type author (no quotes) and you’re done. This is NOT a completely foolproof method, especially if you have a theme that overwrites author settings in the .php code. A more streamlined solution can be found with WordPress plugins. The GPAISR (Google Plus Author Information in Search Result) plugin will do the trick, and the authors have kindly given clear step-by-step instructions on how to implement the plugin settings to achieve authorship. Neither of these first two solutions will help much for websites with multiple authors (i.e, most of them — even if you have a blog that is 90% your own, but with the occasional guest blogger). Luckily, there are two recommended plug-ins for just these sorts of circumstances. For slightly less of a challenge, WP admins may want to look at the Google authorship for multiple authors plugin. This will simply add a Google+ field for each user to enter their profile link. A good means of checking to see if authorship is implemented correctly is Google’s Rich Snippets Testing Tool. As I said before, author information will not appear on the SERPs right away, so this is a perfect way to discover if more tweaking needs to be done. Don’t be overwhelmed at the steps you need to take to establish yourself as an author where Google is concerned. There are plenty of additional resources out there to address whatever specific problems you may encounter along the way, starting with Google. Just keep in mind that this will develop your presence in a way that no other method of networking and marketing can match — after all, Googling is an official verb now, and the world will be searching. Make it as easy as possible for them to find you!